Courchevel Moriond . 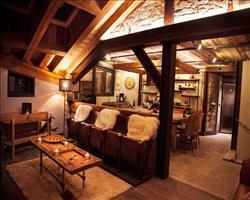 Chalet Corelli occupies a fantastic location in the centre of Courchevel Moriond (1650). The resort main street’s ample selection of shops and restaurants are right on the doorstep. Skiing in Moriond is accessed via a short 130 metre walk to the escalator which takes skiers up to the Front de Neige and the lifts. The ski bus stop is 30 metres from the building, which takes skiers the short 10 minute ride either to Courchevel (1850) or Courchevel Village (1550) from where the Grangettes télécabine runs directly up to La Croisette, the main base station of the Courchevel (1850) ski area. This charming and traditional chalet-apartment was until recently a family home, as is evident from the comfortable and inviting décor. The open-plan living and dining area has a genuine home-from-home feel with wooden floorboards, a rustic wooden dining table, and plush sofas to sink into after a long day on the slopes. 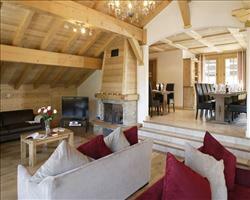 There is also a large balcony on which you can enjoy an après-ski drink and take in the views. Bedrooms are homely and characterful, and most benefit from en suite facilities. Room 1 has its own shower/steam room and an additional bunk room for children only, where they pay only half the adult full price, making it a great choice for families. 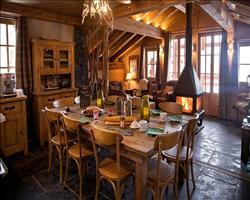 Chalet Corelli is located on the fifth floor and accessed via a shared lift. The chalet has its own private ski locker in the communal ski room, which is located on the fourth floor of the building. Room 1 add £7 pp/pn. When additional bunk beds are occupied by children aged 2-11 years they pay half the adult full price. Room 3 add £3 pp/pn. We update Chalet Corelli's details often, but facilities do change. e.g. some extras listed by the supplier as "free" or included might only be for the first time you use them, or for one time per party, then charged for further use. If any specific feature is essential to your holiday, make sure you ask us to confirm the details of it before you book your holiday. This package holiday to Chalet Corelli in Courchevel, France departs Saturday 14th December 2019, for a 7 night stay on a "catered chalet" board basis. A local tourist tax (Taxe de Sejour or Kurtaxe) is levied by many councils in European ski resorts. It varies by standard and type of accommodation and is age dependent, so not everyone is charged. It's not included in the basic price of your holiday and is usually paid locally. For reference, the average charged in winter 15/16 was between 50p and £2 per person, per night. Courchevel lift pass price last reported as €218 (adult 6 day). Ask for a quote when booking Chalet Corelli.